The list of things to buy when you’re expecting seems never-ending, and most things you can usually do without, but one thing you absolutely need from the start is somewhere for your baby to sleep! 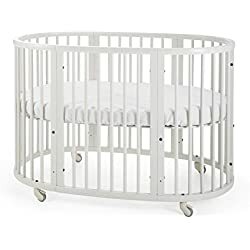 Often you will start with a co-sleeper, bassinet or cradle, but as soon as he or she outgrows it (sometimes after just a few months) you will need to purchase a crib. 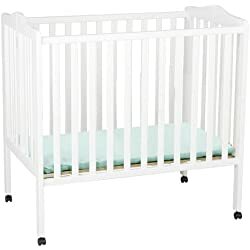 A crib or cot is simply small bed with high, normally barred, sides, for babies and toddlers and sometimes you can removes the sides and have a perfect little toddler bed as the child gets bigger, this is called a cotbed. Which qualities should I look for when choosing a crib? Size is a very important factor when choosing your baby’s crib, and it largely depends where your baby is going to sleep. After the first 6 months, it’s safe for baby to sleep in his or her own bedroom, unlike the first 6 months when it is important to sleep in close proximity to reduce the risk of Sudden Infant Death Syndrome (SIDS.) Some parents choose to keep their baby in the bedroom, so you have to consider the space available, and similarly if the baby has a nursery, is there a lot of available space for a crib? For smaller rooms and often in apartments miniature cribs are becoming more and more popular, which are perfectly big enough for the baby and yet take up a lot less room than traditional, large cribs. Cribs can have fixed sides that don’t move, or a drop-side to allow for easy access. If you do want a drop-side you should be able to lower the side with one hand, so that it’s not difficult whilst holding your baby. Some cribs have teething rails, which is a non-toxic plastic covering which protects baby’s gums and teeth and also the crib, when he or she starts teething. You can also buy this separately. Some cribs have height adjustment; this means that you don’t have to reach far down to put down or pick up your tiny baby, you can lower it slightly when he/she manages to roll over, and when he/she can stand up unaided you can lower it again. Some cribs grow with your baby with extension kits, and of course there is also the option off cotbeds which are great value for money, as you can keep the same crib even when your baby outgrows it, as the sides can be removed to create a toddler bed. Low cost cribs are hard to find, but particularly convertible cribs which will last you a lot longer than a basic baby crib. 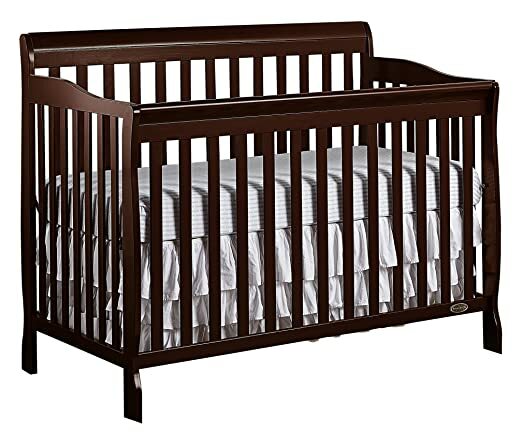 Often, you’ll splurge on a good quality crib which will last you a long time, or scrimp and save and buy a cheaper version which doesn’t last half as long. This crib from Dream on Me called the Ashton 5-in-1 is designed to last a long time at a fraction of the cost of its competitors. 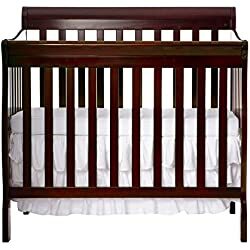 One of few reasonably priced cribs available in this day and age that are also convertible, it can be converted into 5 different styles; a baby crib, toddler bed, a day bed, and 2 types of full bed. It’s worth noting that the toddler guard rail and also the bed frame are sold separately. The rail doesn’t drop, but that won’t impede your access as there are 4 mattress heights so that you can accommodate your baby as he or she grows, to avoid falling or climbing out. The height is altered by removing 4 screws, selecting the height you want and then re-tightening. A user manual is provided as well as the assembly kit. The mattress is not provided but can be bought separately. The “Ashton” is available in 8 different finishes. Some parents said it wasn’t very easy to assemble but they managed, and it isn’t the most perfect appearance if you look very closely, but overall it’s a sturdy, long-lasting crib with a simple, stylish design all while being a low price baby crib. Weather you’re after a dark cherry crib, an espresso colored crib or different shades of grey cribs, the Dream on Me has 8 colors to choose from. A lot of parents wants their nursery furniture to match, but full sets with wardrobes and cribs and chests of drawers cost enormous sums of money, and very few people have the space for all that! A crib with a changing table and drawers is a perfect compromise. The Portofino crib by Storkcraft, in white or dark wood, has a fixed side at a slightly lower high than the far side, for easier access to put baby down and pick him up. The changing table has 3 drawers and 3 shelves to keep all of the things you need for baby changing at hand, and the vinyl changing pad is included. This all in one baby bed is convertible 4 ways, from a baby crib, to a toddler bed, to a day bed and even a full size bed, to expand with your child as he grows. 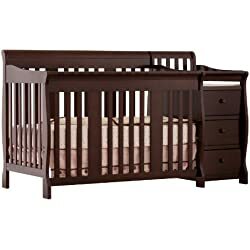 If you are looking for full baby crib an furniture sets, Storkcraft make other pieces of furniture to go with this white nursery crib or dark wood crib. The mattress height can be adjusted but it requires taking out screws. The Hudson Convertible Crib by Babyletto is a stylish, modern crib which converts into a toddler bed (conversion kit included) and also into a day bed. Babyletto are eco-conscious has been low-emission Gold certified by Greenguard. Parents shouldn’t have to sacrifice style for safety or vice-versa, so the Hudson crib really does combine the two. The crib is very sturdy and robust made from New Zealand pine wood, and the mattress height can be changed to 4 different positions. The toddler rail is provided for added safety when your little one outgrows his/her crib, but isn’t quite ready for a child bed. Parents have said that it was simple to assemble and doesn’t show signs of wear and tear even after couple of years down the line. This ultra-modern crib by Ubabub eliminates that prison-like feeling of bars on the side of a crib, which some parents find unpleasant for a young child. The mattress height can be adjusted for easy access to a small baby and can be lowered as the baby gets bigger. When baby outgrows the crib, it can be converted into a stylish toddler bed, with the conversion kit included. The crib has a pod style, which means it is cocooned shaped with rounded edges for a soft environment for baby and a modern appearance. The Pod 3-in-1 has plastic sides which make it easier to check on baby and let him or her look around while awake with an unimpeded view, and prevent him/her from feeling confined. There are star-shape cutouts on the acrylic to add style and sooth your baby. The plastic is recycled and BPA free, making it unharmful to the baby and great for eco-friendly parents. This is a high quality crib with an ultra-modern design, which will make your baby feel comforted rather than enclosed. This crib can literally be used for almost a decade, if that isn’t durable, then what is?! 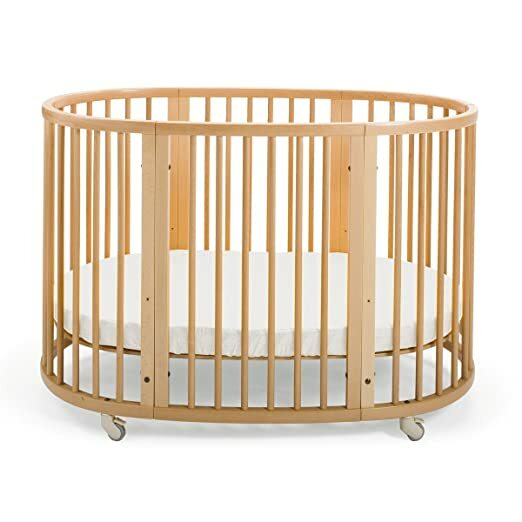 The Stokke Sleepi is a wooden crib in either natural wood or walnut, with a unique oval shape and no harsh edges. It has wheels to easily manœuvre around the house for daytime naps as well as night-time sleeping. 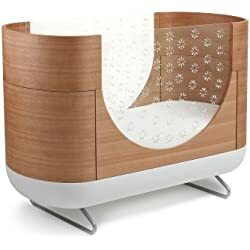 It stars as a bassinet and expands into a crib, then it can be transformed into a toddler, and later with the conversion kit it can turn into a junior bed. The conversion kit is sold separately if you would like to use it throughout the whole childhood. Parents say that this crib has a high quality finish and love its distinctive design, and that it is really easy to assemble. Small apartment? Small nursery? Or do you just want to save space for playing rather than using a big bulky crib? You need a mini crib! Mini cribs are big enough for your infant to sleep spaciously but they’re a much more compact size, to really make the most of the space in your home. The Aden convertible crib from Dream on Me can not only be used as a day bed in its mini form, but can also be expanded and used as a full sized twin bed, meaning that you can use it form birth and into childhood. All tools for assembly are included but the mattress isn’t (apart from a soft pad but you ought to buy a real mattress in my opinion). Mattress height is adjustable at three levels to accommodate your little one as they grow, so you can easily access your newborn and lower the mattress as they become more mobile ad eventually stand up. All materials are BPA free and are also free of phthalates, latex and lead. The Aden mini crib is made of solid wood yet weighs only 20lbs, and is available in 8 different non-toxic finishes, just like its larger counterpart. Another great mini crib is this one from Delta, the portable mini crib which is a lightweight crib that folds flat for easy transportation and storage. A thin, waterproof mattress is provided. The two mattress positions allow you to change the height when your baby grows. The sturdy build includes stationary front and back rails. 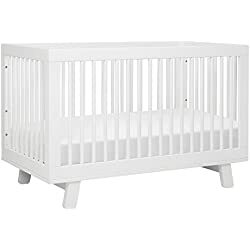 This crib is extremely lightweight, is great for small apartments or bedrooms and also for daytime naps if you want to use it in other rooms around the house. It folds to a mere 6″ wide and is therefore great to travel with as well. It has a simple yet stylish design and hooded caster wheels to move it around easily, it also fits through doorways with ease due to it’s tiny size. Crib mattresses and bedding often aren’t provided, so keep an eye out – I’ll find the best ones I can and write my recommendations here later on.